הנה לא ינון ולא יישן שומר ישראל תהילים Indeed, he who watches over will neither slumber nor sleep. 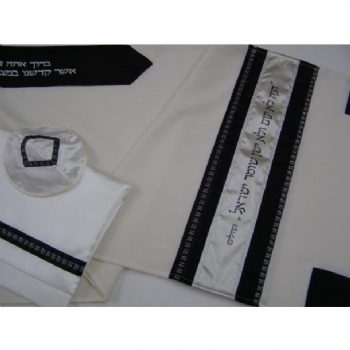 (Tehilim).This tallit comes as a set with a matching tallit bag and kippa & standard Blessing embroidered on the atara neckband as shown. Posted in Classic Tallit and tagged Biblical Verse Shawl, Wool Shawl.